Tiffany—“like Tiffany & Co.”—has lived here her whole life. Her hair is woven into a neat French twist. “Cops come and sit in here,” she says, waving her hand at the shadows on the small plaza around us. A white plastic bag rustles in a spring tree. Tufts of white flowers cover the branches like a sweater, against the chill of early evening. We raise our voices over the noise of a generator, one of a score of rumbling machines across the city that has flooded housing projects with chemical light, noise, and the guise of safety for five years. Tiffany needs to fix dinner; her kids are hungry. Her forty-first birthday is coming up. Tomorrow she’s going to a pole-dancing class with friends. “You look good,” I say. She tosses a hello to a passing neighbor who’s pushing an overflowing grocery cart. Her gold hoop earrings sparkle. Each building of Red Hook Houses is a community, often comprising several generations of families. The adults, Tiffany tells me, have known one another their whole lives. Somebody’s always outside watching the kids as they play. Past the trees, beyond the light’s reach, the playground equipment sits empty. An urban garden of raised beds fills the dark. It’s too early for any green to show through the dirt. The area between the buildings, Tiffany’s front yard, is pretty and fresh. “At first that light was right in my window,” Tiffany says. “Everybody complained. They turned some of the lights then,” but the glare and noise continue. “I guess it’s safe, but they still harass the kids.” She means the cops. From dusk to dawn, the Red Hook Houses hum with construction lights, though there is no construction. The generators rumble to a coughing start as the waterfront’s sunlight slides off the red brick of the four-, six- and fourteen-story buildings, retreating from Red Hook Channel and Buttermilk Channel, Erie Basin and Atlantic Basin. With a rumble, a gas-generated light pools between buildings, collecting like water, concentrating as the sun dies. Dozens of them, chained fast under the pretense of safety, slapping light across the sidewalks and plazas. Under the pretense of service. 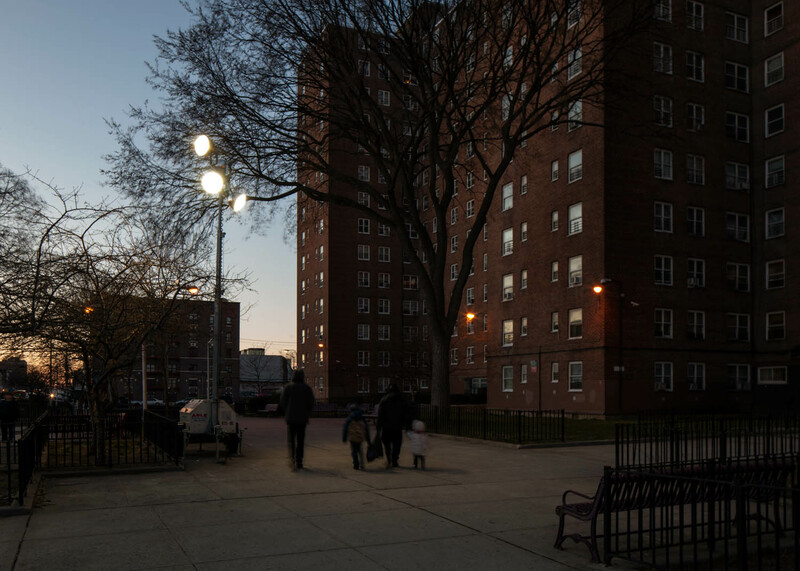 These are the largest housing projects in Brooklyn—6,500 people, mostly African Americans, Asians, and Latinos. The lights are the background, the ballast, for their footsteps, their shopping, their gossip and small talk with neighbors, their going out and coming home. A rumble and brightness undergird life here. In 2012, Hurricane Sandy steeped the neighborhood in a cocktail of sewage, chemicals from the nearby Superfund site, the Gowanus Canal, and fuel oil from basements. The rainbow-colored slick of oils and god-knows-what coated the benches, the cars, the trees. Everything up to your waist was poison. The hurricane’s toxic tide killed half the trees in Coffey Park and corroded all the underground wiring for the Houses’ outdoor lights. Everybody lost something. That’s when the NYPD wheeled in the generator lights. Never let a disaster go to waste. They were necessary, the NYPD said, for safety. They did not mention surveillance. No one wants to live in darkness, but the lights aren’t really for the residents. They know this. Safety, surveillance: It’s hard to tell the difference. A label on the light behind him reads in big, red Barnum & Bailey letters: ABLE. Able Equipment Rentals. With three offices: Long Island, New Jersey, Philadelphia. It’s a sweet contract. 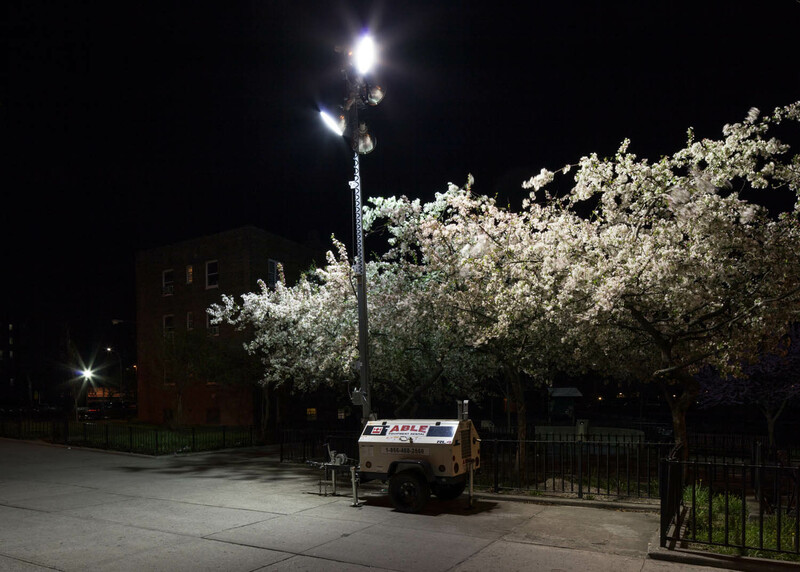 In March 2016, Mayor Bill de Blasio launched a study to look at the effect that lighting has on housing developments, “advancing the de Blasio administration’s commitment to promote safe and strong neighborhoods through comprehensive and innovative strategies that extend beyond traditional law enforcement.” This is how it works. Get some folks from the projects to weigh in, call it a partnership for the Mayor’s Action Plan. Use asset forfeiture to pay for the lights ($5.6 million). You can argue that black bodies should not be criminalized for being in public: Eric Garner (July 17, 2014), Michael Brown (August 9, 2014), Black Lives Matter. Tough-on-crime adherents will point out “police assassinations”: Wenjian Liu and Rafael Ramos (December 20, 2014), Blue Lives Matter. Scott Downs at LawEnforcementToday.com writes that basically everybody is “fueling the fires of misinformation with unfounded, and subjective incendiary rhetoric placing the law enforcement community in harm’s way.” It’s the cops vs. everybody. It’s cops’ safety at any cost. “Omnipresence is based on an implemented theory that police presence deters criminal behavior,” Downs writes. Omnipresence. That’s God, everywhere at once. The all-seeing eye. That’s what NYPD officers are when sitting in their satellite office on the back side of Red Hook West, Building 1, or in a car on the sidewalk at Ninth Street. Or when two officers huddle under generator lights. Omnipresence is the generator lights, shining in windows, their aluminum bowls reflecting sulfur-bright into the bedroom of a brown family, bleaching the night of color. The lights began here in Red Hook with Sandy, Nathan says. But all over the city, there are lights. Even as the anti stop-and-frisk mayor, Bill de Blasio, campaigned against racial profiling with his Afroed son, the lights remained. Even as crime rates fall in the projects, in the city. 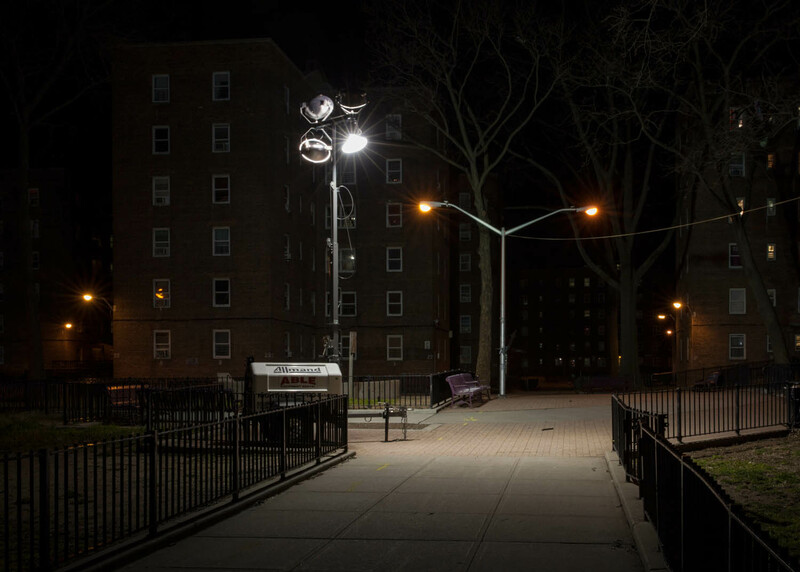 Even as de Blasio gives deep-pocketed townhouse developers their way with vacant lots in the projects, the lights are still here. There’s projects Red Hook and there’s white Red Hook. Projects Red Hook has the Associated grocery store, Kennedy Fried Chicken, the senior center, the 99-cent store, the deli with the bullet-proof spinning window, open 24/7. White Red Hook has the Fairway, the Ikea, a few funky bars and a few popular restaurants, one named for the Revolutionary War–era fort that once stood nearby. But that parsing of amenities isn’t really accurate: class and race boundaries are porous on the street. Between 2000 and 2014, the white population of Red Hook grew by 320 percent. The story of gentrification, the story of New York. Housing prices too damn high, white people moving deeper into the boroughs. A creeping radius of displacement. They bring restaurants and galleries, push out lower-income families, shredding communities. But the projects remain. I don’t see any generator lights in white Red Hook. “Does inequality cause crime?” the Atlantic asked in 2014. Why the hell shouldn’t it? I moved here in 2008. My first day volunteering at the senior center, there was a murder investigation right outside the front door. A woman’s throat was slit as she sat on a bench. A pregnant woman got shot in front of the Section 8 housing next to my apartment. The baby died but she didn’t. The generator lights aren’t working. “I’m assuming if they weren’t there, this area would be dark,” Whitney says of the humming lights, a black plastic bag in her hand. She smells of booze and tobacco; the weather is cold. She just wants to get home. Walking away, she passes through the cone, as if spotlighted on a stage. She looks back, ducks her head as if to hide, exits stage left. The Associated. Edward Lunch. Lil Larry’s Liquor/Wine. La Nueva Candy Store. Boost Mobile Phone. Cheng’s Chinese. Two cops roll by on Lorraine Street in a demoralizing, copped-up Smart car. It’s warm. Nobody’s wearing a jacket. “Give me your hand, monkey,” a mother says affectionately to her jangling four-year-old as they cross the street. “A lot of people complain about the noise,” Michael H. says as he rolls up to me in a motorized wheelchair. He’s on to my question already. His belly is pushes a tight stained shirt. His white hair and beard are newly trimmed. 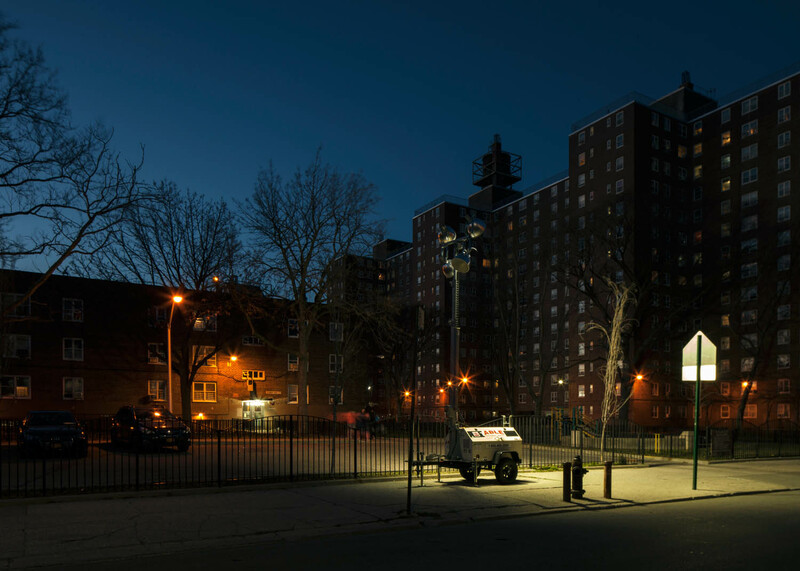 “NYCHA is not what it used to be.” He was a groundsman for NYCHA, the city’s housing authority, pronounced nigh-cha, for fifteen years, through the late eighties and early nineties. “Daly got killed right here,” he says, jamming his hand up and down. A beloved local principal, shot dead while looking for a pupil. 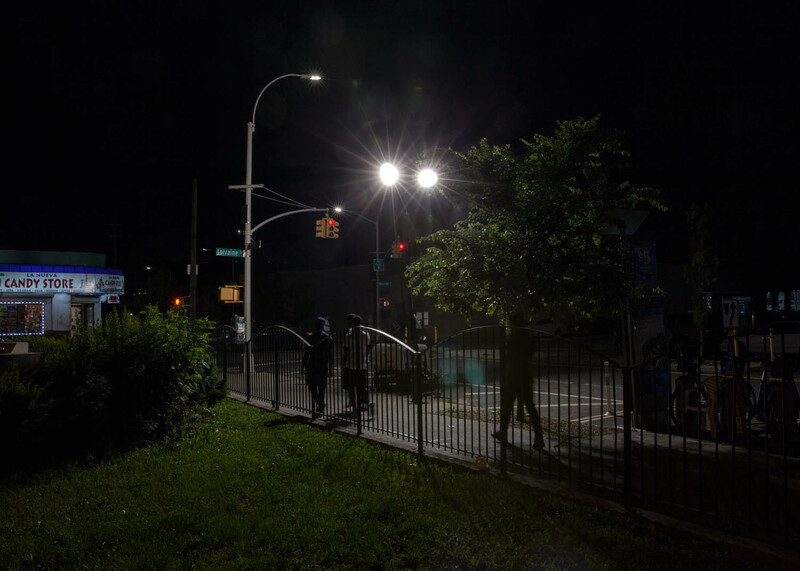 As reported by the New York Times: “streets ruled by violence,” “in the notorious Red Hook waterfront district,” “a crime-ridden housing project.” Red Hook’s 1991 crime tally: twenty-one murders, ten rapes, 526 robberies, and 364 assaults. But everybody at the senior center complains when fourteen Citibike stations show up on the streets one morning—rental bikes marketing an international bank. Gentrification takes up too much parking. Elizabeth Felicella’s work appears in the New Yorker, the New York Times, Vogue, and elsewhere. i am most sympathetic to the neighbors who must put up with the noise these lights generate and glare entering their apartments. 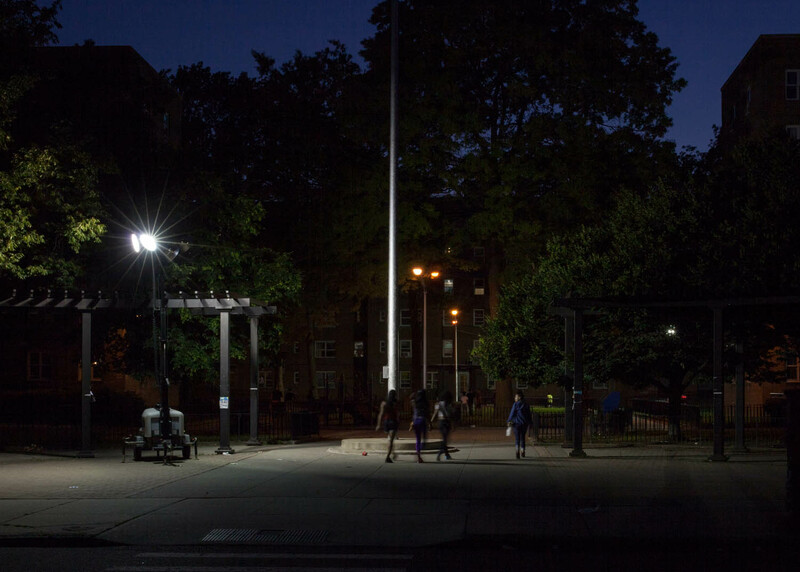 It makes sense to provide some outdoor lighting to enable people to find their way and discouage mugging, but the community deserves intelligent design from lighting experts who appreciate the psychological affects on people.